We did this recipe not long ago as a fun pairing for our Maple Wine (also an excellent choice for spring 😀 ), but it would be just as tasty using our *Mapple wine. The added pop of rich apple flavor, along with the maple, is an added bonus. Feel free to experiment with this recipe too; instead of doing a frosting you could use this cake recipe as an alternative base to an upside down cake, baked on top of apples caramelized in butter, maple syrup, and *Mapple wine! There are so many fun things to do with apples and maple, and you have both flavors in one bottle! Explore away. Who says you can’t have cupcakes for breakfast?? There’s something about the smell of pastries baking in the morning that brings back some serious childhood memories, especially in the winter. Walking downstairs, the smell of fresh-out-of-the-oven muffins always seduced me into taking those last steps over the frigid wood floor. They were steaming, scrumptiously sweet bites of heaven, not to mention their partner in crime: a mug of hot chocolate with a marshmallow crown. And it was for breakfast. Whoa. Adults always seemed to find reasons to break the “no sweets for breakfast” rule. Now as an “adult”, I find that my craving for sweets has turned down a few notches. If I started my day with that much sugar, I would be a wreak, not to mention my taste buds would be totally out of commission. When you taste wine as often as we do, you realize your days of skittles and fruit roll ups are essentially over. But this doesn’t mean we have forgone the world of dessert, no sir. When we find something that has “sinful” written in the margins, that’s the end of it, there’s no stopping us. While our kid-selves might have craved any old sweet, our slightly more mature selves crave something covertly sinful. Back to muffins. Again, these are tasty morsels that have earned their stolid position in the breakfast realm, and they can certainly be a real crowd (or me) pleaser. But honestly, they are essentially naked cupcakes. They are just so honest and innocent, there’s not an ounce of taboo left inside their tender crumbs. But throw a silky, decadent layer of icing on that cute little puff, maybe some booze , and hallelujah. My kind of crazy. These cupcakes are a perfect example of a little naughty thrown in a batch of nice. They take a lighter spin on a classic carrot cake, losing the gritty nuts and letting the sweet raisins strut their stuff. The texture is light and fluffy, so much so you might even convince yourself to have two! The plain looking white frosting on the top is not so plain after all: it’s a luscious combination of sweetened mascarpone cheese hit with a healthy kick of our signature Maple Wine. This is my inner child craving sugar, but sneaking it into a more lux package. And guess what guys, these babies have fruit and vegetables in them, so go ahead and have these cupcakes for breakfast. Or shall we say ‘well dressed’ muffins? Whichever makes you feel better about the situation, I guess! P.S. Don’t forget that left over Maple Wine to sip alongside these treats. The wine and cupcakes were made for each other, so don’t let them be lonely! Beat the sugar, vegetable oil, vanilla, and eggs together at medium speed until they are light in color, about 2-3 minutes. Mix in the flour, baking powder and soda, salt, and spices, being careful not to over mix. Fold in the carrots, raisins, and Maple Wine with a spoon until just combined. Scoop batter into the greased/lined cups so they are 2/3 full. You may not fill all the cups; remove the liners of the unused cups. Bake for 20-30 minutes (this will depend on the efficiency of your oven, so keep an eye on it) or until an inserted toothpick comes out clean. Remove the cupcakes from the oven and let cool for at least 10 minutes. In a medium bowl, beat the mascarpone cheese, Maple Wine, vanilla, and ¾ of the confectioners sugar together at medium speed until smooth and silky. Taste the icing; if it is too thin or not sweet enough, add the rest of the sugar. Fill a ziplock bag with half the icing, and cut of the very tip off one of the corners. Frost the cupcakes by gently squeezing the icing through the tip of the bag. Sprinkle the frosted cupcakes with a little maple sugar. When I think of spring, not only do I think of warmer weather, I think of how best to use these longer, more temperate days. Especially after months of frigid weather. I mean, it was cold, even by Vermont standards. But it is over and done with, and will only make this summer season even more pleasant. Now back to my day dreams: to me, making good use of these summer afternoons usually involves copious amounts of food, libations, and of course, lovely company! If we are talking June, we are talking back-yard wine cocktail parties, where roses (and Rosés) can once again take the stage. I am a person that loves Rosé all year long, but the wine especially captures the spirit of spring and early summer; it’s crisp and bright, with floral and fruity linings peaking through, and just enough body and texture to keep up with the cooler evenings as we descend to twilight gatherings around a fire. You might even find a semi dry rosé that works well with s’mores! Note: If you do, please let us know ASAP. We must know. For obvious reasons. While s’mores are all well and good, for a wine-themed cocktail party you might be looking for something a little less messy. Like a simple nibbler that can complement what’s in your glass, or be enjoyed on its own. Our Little Piggy Pink is a classic late spring/early summer sipper, with its juicy cherry aromas and sweet-tart finish. It is a most versatile of wines, and can be teamed up with char-grilled venison burgers, mounds of strawberry shortcake, or going it alone as you recline in an Adirondack chair at a Vermont vineyard (hint hint). On one of our recent culinary escapades we discovered a little savory treat that would be make for some great nibbling food. A simple crostini topped with peaches and blue cheese, finished off with a drizzle of local honey, partnered with our fruity rose. We loved this recipe because it was super easy, super fast, and super yummy. It also gracefully accommodates pantry miscalculations, so if you don’t happen to have peaches available you could probably substitute juicy pears, nectarines, or even mango if you wanted to get a little wild! We are fortunate enough to have many wonderful bakers who provide us fresh bread, as well as many fruit growers and cheese makers, so if you are a local warrior you can always find ingredients around here to suit your fancy. The cambozola cheese in this recipe is a triple cream gorgonzola, so it is very strong; if you prefer a milder or sweeter blue cheese, we would suggest trying Middlebury Blue or Bayley Hazen Blue. I wouldn’t say no to a fresh chevre or tomme either. Point is: have some fun with it! Our afternoon of cooking was far from over! After some deliberation, we decided that our waistlines would benefit from something a little more healthy to go with our crostini. We found this fun recipe for buffalo chicken quinoa bites, with a greek yogurt blue cheese dip. that goes along with our easy fast and yummy theme. Crispy on the outside, cheesy and meaty on the inside, and the quinoa provided a great chewiness. We also whipped up a delicious combination of fresh fiddleheads, ramps, and farm eggs. While not a finger food, it is still a pretty plate to have at a dinner party or even as a brunch item! There are not many measurements with this recipe as it was partially on the fly, so just adjust to your liking and people being served. After tasting all of the dishes individually, we dived head on into matching them with wine. While the original intent was to find some delightful pairings with our Vermont Rosé, in the end we discovered that our recipes went better with some of our other wines instead. Fortunately (and unsurprisingly), we had a fresh supply of other wines at our disposal. The peach and blue cheese crostini was a hit with our Little Piggy Pink, with the fruit cherry flavors of the wine hitting the same sensory notes as the peach, and creating a great alternate to the rich blue cheese. The tangy quinoa bites were just a little too hearty for the Vermont Rosés acidity; however the richer berry notes, spice, and hint of sweetness of the Dog River Red held up eagerly. The hotcake and fiddlehead dish was rich and bright at the same time, a perfect match with our succulent yet invigorating La Crescent. The Vermont Rosé doesn’t need big flavors, it was very happy to go with some leftover French fries and the Pan Fried Fiddleheads. 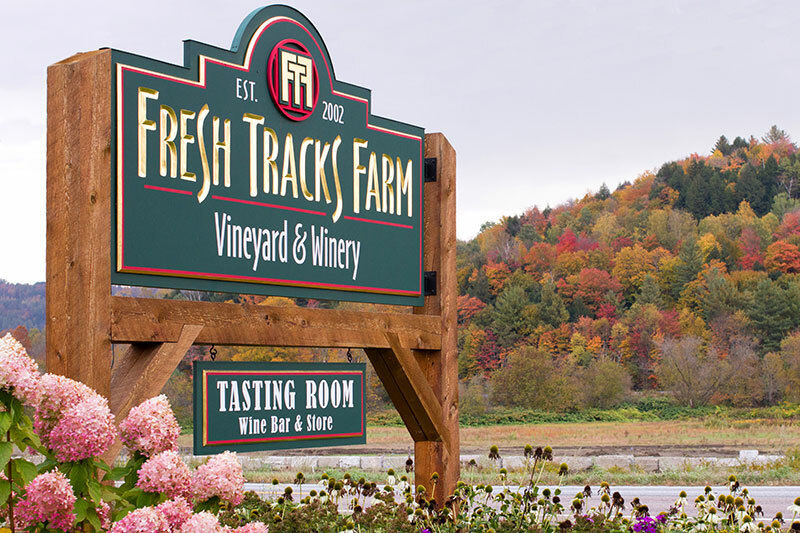 Ultimately, we’re always on a quest here at Fresh Tracks Farm – even when we’re off the clock. It’s a quest for the perfect pairing. That ultimate fireworks moment when you take your first bite and then, when you add a sip of wine to the mix, the flavors dance together in happy harmony in your mouth. When we find that combination, the whole experience is better than the sum of its parts. And in order to better discover those hidden Perfect Pairings, we have enlisted the help of many local producers, such as Nutty Stephs, Von Trapp Farmstead, and Vermont Salumi. Our food-and-wine events were created with the idea that wine can be better with food, and food better with wine. We wanted to give everyone the opportunity to create their own ‘Wow!’ moments, and what better way to do that than providing the space, food, and wine all in one place! The smell of roasted vegetables, melting butter, and cured meats wafted through the kitchen, and a smoky haze permeated the space, a telltale sign of cozy-cooking at work. The three women – Christina, Hannah, and Tracy – had shed their roles as winemakers and managers, and were now bouncing around the room in a whirlwind of culinary prowess,with spatulas, pots, and pans in hand. It was truly a sight to behold, and the end-result was even more splendid: an entire table filled with toasty grilled ham and cheese sandwiches; pancetta puff pastries with melted cheese, scallions, and prosciutto; a kale salad mixed with a medley of citrus fruits; and a hearty arugula salad topped with sliced apples, crumbled blue cheese, and roasted Brussels sprouts. The pièce de résistance? Two freshly uncorked bottles – The Messenger and Vermont Apple Wine – stood in the center of it all, begging to be paired with the surrounding food. First, we started with the Citrus Kale Salad (detailed recipe here). A delicious blend of sliced grapefruit, orange, avocados, and pea sprouts, atop a nest of chopped kale and radicchio, with grapefruit vinaigrette drizzled on top. The beauty of this salad comes from its simplicity. All the ingredients give a little something; sweet-tart citrus, creamy avocado, hearty kale, crunchy peas, bitter radicchio, and the pop of the pea sprouts to top it all off. The juice from the citrus played into the vinaigrette, allowing the citrus presence in the salad to be distinct without overwhelming any of the other flavors. The colors remind us of spring and sunny days – which are just around the corner, we hope – while the flavors are distinctly hardy and cold-weather oriented. The dressing was just as simple: mix the juice collected from segmenting the citrus with a little red wine vinegar (thankfully we make some right here on the farm), whisk in some olive oil, and season with salt and pepper to taste. Fabulous. Our other amazing salad was comprised of arugula, apple slices, roasted Brussels sprouts, peas, and red onions (full recipe here). Arugula is a terrific and versatile ingredient. It can be worked into salads, omelets, soups, stir-frys, even sauces. Here, it’s was the base for this substantial salad, perfect for a side dish or a light meal. A bed of arugula holds the roasted Brussels sprouts, local Empire apples, slivered peas, and pickled onions. The crown to this dish is the blue cheese, which adds a little more richness and salt. We used “Middlebury Blue” from Blue Ledge Farm in Leicester, Vermont. The grilled ham and cheese sandwiches (full recipe here) served as our “main dish,” so to speak, and were incredibly easy to make. Simply add some ham from North Country Smokehouse, slice up some Gruyere cheese, and melt it all between two slices of buttery, toasty bread from O Bread Bakery in Shelburne – we used a smoking-hot cast-iron pan for this recipe, too. Also, if you’re looking to spruce up this already-delicious meal, try spreading a little Rosé Wine Jelly on one of the slices of bread. It will add some sweetness to counter the salt of the sandwich. Out of all our available wines, we were drawn to The Messenger in particular when tasting these cheesy treats. The savory, almost-caramelized flavors of the grilled gruyere and ham blended beautifully with the woodsy components of the wine, and The Messenger’s acidity downplayed the sandwiches’ salt to a level of elegant sensory interplay. Translation: It rocked. The puff pastries were topped with gruyere, cheddar, scallions, prosciutto, and ground pepper. Simply take the dough (bought frozen), add the extra ingredients, set the oven to 400, and stick them in for fifteen minutes, or until the outside turns a nice, crispy golden-brown. Be careful if you finish cooking these before the rest of the food is ready – I nearly spoiled my appetite just from snacking on these alone. The Vermont Apple Wine was a home run when coupled with this flaky delight: its sweetness and crisp, juicy intensity complemented the pastry’s richness and the wine’s spicy finish married well with the prosciutto. Not to mention the fact that cheddar cheese and apples make a perfect pairing on their own. Like we said, it’s a no brainer. All in all, it was a near-perfect way to spend an afternoon. Friends gathered together, creating and enjoying a well-earned meal. And we hope, ultimately, that you can take this recipe with you and make your very own rendition to share with friends, family and loved ones, too. A word of caution, however: stock up on napkins, because this can get deliciously messy! Wine Dogs are Best Dogs – Meet Arthur! <— Arthur the wine dog meeting the greats that came before him…he has some big tracks to fill here at the farm, but he doesn’t look too intimidated. We’d like to formally introduce you to Arthur, our new Fresh Tracks wine dog. He’s a golden retriever who loves the snow and following everyone around. He’ll be spending time in the winery as well as out in the fields keeping an eye on things. He already met the horses Colleen and Mr. P, which left him feeling rather quiet and extra cuddly. We might wait a few days before introducing him to the chickens! If you happen to see him on your next visit to the winery, you’ll be happy to know that he loves people. With all of his incredible cuteness, he’s a bit of a distraction here on the farm, but nobody’s complaining about that! Welcome Arthur! Toward the end of December, we were contacted by the folks at Edible Green Mountain Magazine. They asked us to describe what the word “local” means to us, as Vermont winemakers and farmers. This is what we came up with. Liz Stephen, our dear friend (and Central Vermont Olympian Nordic skier) is headed for the World Cup! Join us tonight for an informal meet-and-greet sendoff party! Liz will be in the tasting room from 5:00 – 7:00 pm, and as always, we’ll be serving $4 glasses of wine all day and all night long. Please call us at 802-223-1151, or send an email here if you have any questions. Post-harvest season has arrived once again. Our newest wines have finished fermenting, the leaves have fallen off the vines, and the cold weather is settling in. We wake up every morning with a greater appreciation for slower days, and take a moment to appreciate the crystalline beauty that envelopes our glorious landscape. Meanwhile, preliminary taste tests are yielding very promising results for our newest vintages, and we couldn’t be more thrilled. The aroma of the La Crescent is lovely, the Frontenac Gris has its naturally full and tropical palate, and tomorrow we taste the reds again before moving them into the barrel room! As far as the vines go, all of the leaves have fallen off because of the recent chilly temperatures. I find them especially beautiful this time of year, having just bore their fruit and prepared themselves for winter. They look so neat and tidy, and even have this orange-ish hue that contrasts so brightly with the still brilliantly green grass. It looks like a painting, or a picture that has the saturation turned up high – much like the colors that we had this fall! Speaking of which, this fall was incredible. Between the foliage, the sunshine, and the stunning temperatures it couldn’t have been any better. The vines enjoyed it too. Their leaves got to stay on for many weeks after harvest, basking in the sun and storing up lots of essential nutrients for next year. Often we get hit by a damaging frost much earlier leaving the vines less time to prepare for the following year, so we are very excited to see what next year will bring! This week the guys will finish up placing our very own compost at the base of the vines to give them that little extra boost. On top of all of this, we are happy to welcome Mr. P to our farm family. Mr. P is a 9 year old Cheval, which is a Canadian Breed. Mr. P tried to be a bachelor dressage champion in his earlier days but decided that the farm life was a better fit for him (who could blame him?). Now his life consists of trail riding and adjusting to a social life that includes Colleen (our lady horse) and the chickens (they’re real gossipers, you know?). He’s fitting in just fine though, and we are so very excited to have him! You can check out his most recent facebook album here. He likes his picture taken – I think it must be from his dressage days. Anyways, that’s what’s going on around the farm. Thanks for reading! Piggy Pink Lemonade Wine Slushies are the ultimate summer treat to beat the heat! Fruity, cold, refreshing, and supremely easy to make. A party favorite! ENJOY! We do suggest pairing this slushie with a hot afternoon, sandy beaches, boat docks where you feet can dangle in the water, and sunsets. Travel the Capital Area Wine Trail! Be sure to visit our friends (and us) along the Capital Area Wine Trail! Start here, in Berlin, and make your way to North Branch Vineyards in Montpelier, Grand View Winery in East Calais, and the Artesano Meadery in Groton! It’s a perfect way to spend an afternoon, meandering through the delightful Vermont countryside.